We train scientists in essential leadership and management skills. Are your scientists tired of being trained by outside consultants who have no understanding of science and how it is done? Look no further. An open letter to HR and Learning, Development and Training Professionals from Carl M. Cohen. News: read a review of the "Leadership in Bioscience" workshop run by Carl and Suzanne Cohen at Cold Spring Harbor Laboratory in March 2017, written by a workshop participant, here. Leadership and management skills are key factors in the success of scientific teams. We provide proven, hands-on leadership and management training tailored specifically for scientists. Science Management Associates is proud to be featured in recent commentaries in Science , Nature and Lab Manager. 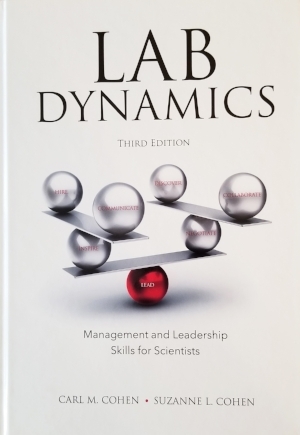 Science Management Associates is excited to announce the publication of the Third Edition of our premier guide to managing and leading in science - “Lab Dynamics: Management and Leadership Skills for Scientists” Third Edition, 2018 by Carl M. Cohen and Suzanne L. Cohen. Read more here. Read about our newest and most popular workshop sequence: "Management skills for scientists," a two-day on-site crash course in managing scientists for both new and experienced managers. This workshop sequence gives scientists a solid experience-based foundation in managing others, negotiating win/win outcomes, running effective meetings, selecting the best team members, setting goals and giving useful feedback. Created and run by a scientist for scientists. Click here for details. Science Management Associates announced two all new workshops for the Spring of 2018. “Best foot forward, Part 1: Interviewing skills for post-docs” is a deep dive into how to ace your most important job interviews. Participants will get the opportunity to learn how to answer the toughest interview questions with complete confidence and will get to practice what they learn during the workshop. “Best foot forward, Part 2: How to give a great job talk” is a practical guide to how to structure and deliver a scientific job talk that shows your work and, more importantly, you, in the best possible light. As in part 1, participants will have the opportunity to practice their skills during the workshop. Together, this two-part series will give post-docs the skills they need to compete successfully in the job market and make a positive impression on potential employers. Combined with our two-day "Management skills for scientists" workshop, these workshops together make up a comprehensive three day sequence "Just for Postdocs: The skills you need to jump start your career in science" that will give your postdocs the skills they need to compete for and succeed in the next step of their careers. We run workshops that enable scientists to become better collaborators, managers and leaders. Our workshops focus on helping scientists improve their emotional intelligence and interpersonal skills. We offer coaching for scientists or science executives seeking ongoing or one-time guidance or advice on the management of scientific organizations, projects or other scientists. We can help organizations with organizational and management structure, managing scientific projects, and mediating conflicts within science teams.